See, when we got engaged on 23 December 1994, Warren and I immediately set about to select a date for our impending nuptials. Given that I was studying in Jerusalem at the time, any wedding would need to wait until I returned at the end of May. Our rabbi didn’t have any availability until August, but my best friend was getting married in August and it made sense to look for another time. Then the fall chagim. Given that I was in school, term break made the most sense. Complicating matters is that our schedules have almost always had us in different cities on our actual anniversary. This year was no exception. But that doesn’t seem to matter so much. It’s part of our story. Our sacred text. The one we’ve been writing together for these many year. 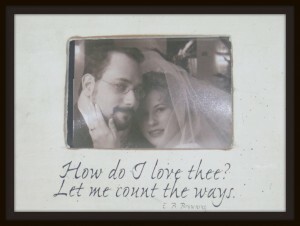 So a very happy un-anniversary to us — seventeen years(+ one week) of kiddushin. May our story continue in our own quirky way. Happy belated anniversary! Y’all could do an un-anniversary sort of thing, like an un-birthday. Loved reading this one! Happy anniversary every day! My husband celebrate our anniversary on a daily basis, particularly on Mondays which is the day of the week we chose for the official wedding day. and we still “I love you” before we go to sleep…every single day for 36+ years.